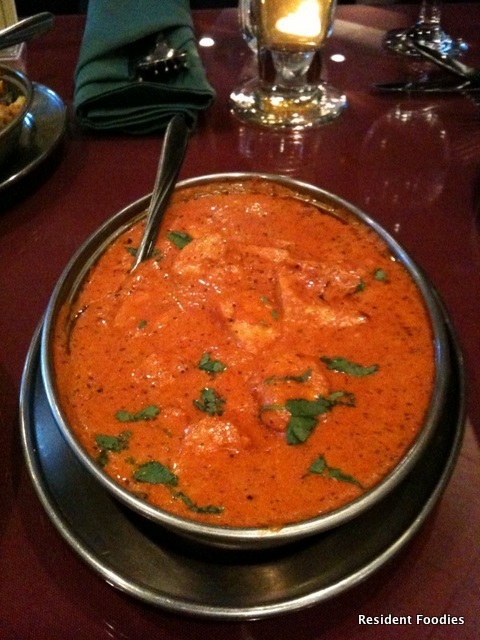 Resident Foodies say: Cafe Tandoor is a cute Indian restaurant with locations in Westlake, Cleveland Heights, and Aurora. 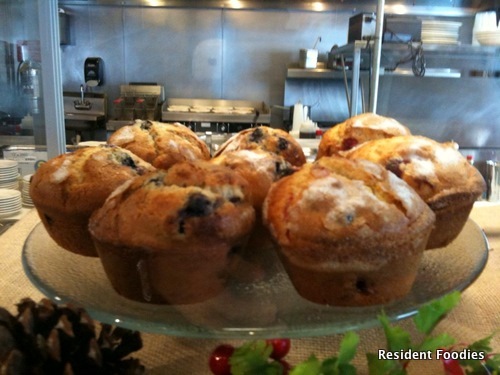 We visited the Westlake location and really enjoyed the food there. 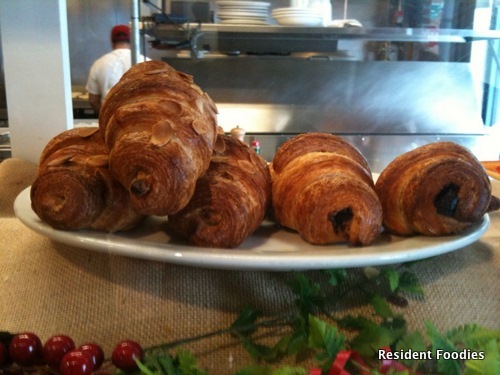 The restaurant is located in a strip mall next to Marc’s, but don’t let the location fool you. The food is far better than the no frills surroundings. We usually get the butter chicken, aloo gobi (potatoes and cauliflower), cucumber raita, garlic nan, and saffron rice. For Cleveland, Ohio (not exactly a mecca for Indian food), the Indian food at Cafe Tandoor is very good. And the prices are very reasonable! News: Scripps Network, the parent to the Food Network, just announced that it will be launching a second channel devoted to food, this one with the emphasis on cooking. The Cooking Channel will air on Memorial Day, May 31. To our great pleasure, Bobby Flay will host a cooking show devoted to our favorite meal–brunch! 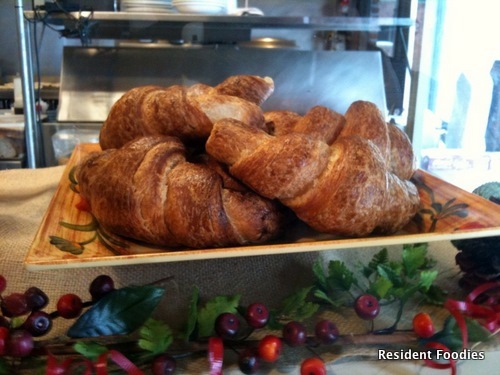 The show will be called “Brunch with Bobby.” Resident Foodies can’t wait. Owners: Kent Rigsby (Rigsby’s Kitchen and Eleni-Christina Bakery) and his wife Tasi. 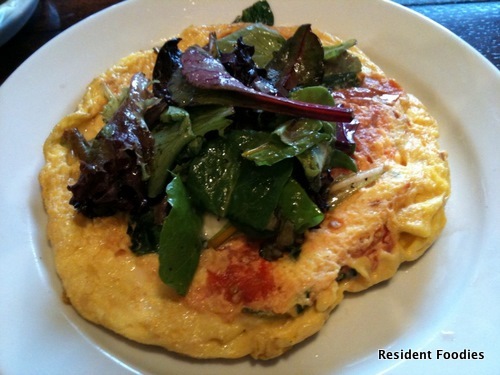 Resident Foodies say: Tasi Cafe is a small, hidden gem in the Short North. 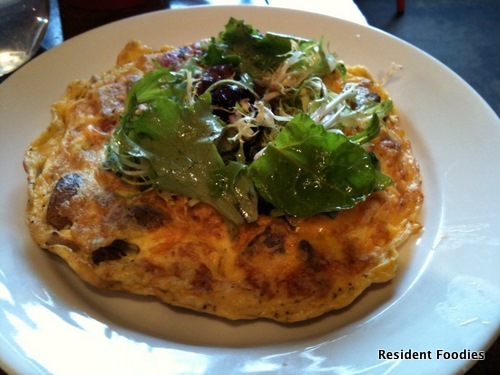 Tucked away off High Street (turn on Brickel St. and then at corner of Pearl), Tasi is short on space (communal tables and smaller tables), but long on assorted selections for breakfast and lunch daily (and dinner on Friday and Saturday). The lunch sandwiches are very creative and tasty (e.g., open faced zoe tuna salad, with capers relish, onions, hard boiled egg, on sourdough toast), but today we sampled some good old fashioned breakfast! 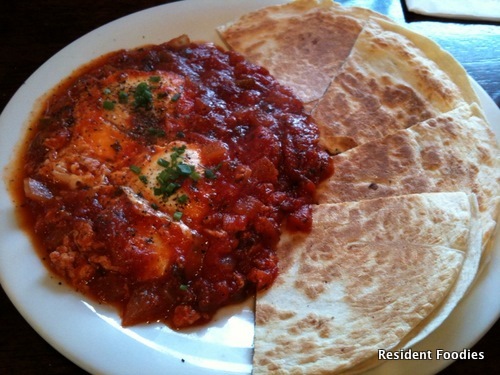 We had the huevos rancheros, and two different cafe fritattes with mesclun salad–one with chorizo, potatoes, onions, peppers, and the other with mozzarella, spinach, and roasted tomato. They were delicious. You can’t find this kind of selection anywhere else in Columbus. Oh, and the baked goods are amazing. 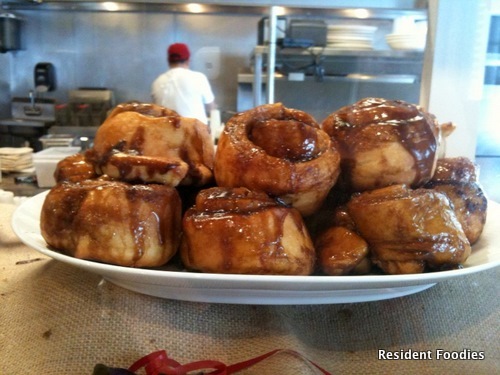 The place gets packed on the weekend, so be prepared to wait some for a table and find a spot at the communal tables. Resident Foodies say: Cleveland is not known for its sushi, but Shuhei in Beechwood is fantastic! The fish is fresher than anything you’ll find in Cleveland, and perhaps in all of Ohio. 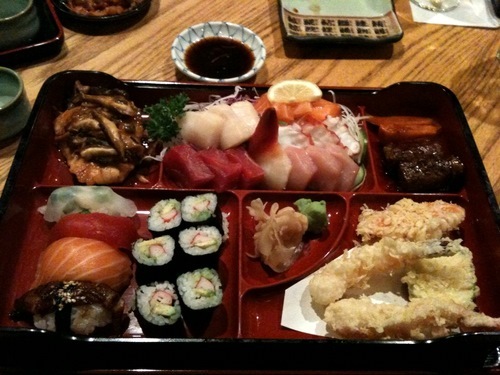 The bento box, shown above, is a total feast, served also with a bowl of udon noodles, salad, and even miso soup. Dishes: Recipe for Bobby’s pulled pork sandwich with black pepper vinegar sauce and green onion slaw. Bobby’s record: Bobby was 4-8 in Season 4. Here’s a video of Lee Ann in a BBQ Pitmasters episode. Throwdown: This week’s episode, Bobby Flay challenges Shawna Lidsky and Katherine Hayward of the Vermont Brownie Co. to a brownie throwdown. The two partnered up in 2008 and work out of the small kitchen of Katherine’s cousin’s bagel shop. Wow, talk about small business! Food Network describes the show: “Shawna Lidsky and Katherine Hayward started the Vermont Brownie Company on New Year’s Day 2008 after deciding they wanted to start their own business. Shawna and Katherine believe Food Network is bringing back the show “Recipe for Success” and they have been selected to feature their signature Dark Chocolate Chevre Brownie. Little do they know that as they prepare to do a demo for their loyal supporters, Bobby Flay will be showing up with his own brownie recipe. Stay tuned to see whose chocolate brownie melts the competition!” Bobby, who is 4-4 for the season, seeks to rebound from last week’s loss to the Wafel Guy. Dishes: Shawna and Katherine made their signature goat cheese (chevre) brownie–which uses local Vermont ingredients, including a layer of goat cheese in the center of the brownie. The brownie also includes cocoa powder sprinkled in, as well chocolate chunks and a dash of salt on top. Yes, salt! By contrast, Bobby Flay made peanut butter, caramel sauce brownies. Bobby used three chocolates–unsweetened, semisweet, and bittersweet chocolate. The peanut butter was mixed into a reduced caramel sauce, and then added and mixed into the rest of the brownie mix. Yum, yum! Judges: Gesine Bullock Prado (author of Confections of a Closet Master Baker) and Adrian West—. Judges tried the Vermont Brownie Co. goat cheese brownie first. Gesine seemed to like it more than Adrian, or at least did most of the talking, particularly liking the goat cheese and the salt on top. The judges noted that the goat cheese brownie was flaky and moist in texture, but the top of the brownie was not as brownie-like as expected. The judges then moved onto Bobby’s peanut butter brownie, which they noted was more dense like a traditional brownie. Judges liked the chocolate, but noted that it was really sweet. Winner: Vermont Brownie Co. Shawna and Katherine win! Bobby’s record: Bobby slips to 4-5 for the season.